At LinkedIn, we love the expression “if you can’t measure it, you can’t manage it,” and we run our business accordingly. But not everything that’s important is easily measurable. Building a strong talent brand is now a strategic priority for most forward-thinking companies. 70% of employers on LinkedIn say it’s a top priority, but only 33% actually measure the strength of their talent brand. Today we aim to change that with the launch of LinkedIn’s Talent Brand Index, a simple metric allowing you to measure, benchmark and ultimately elevate your talent brand. In an increasingly connected world, your talent brand reflects how attractive your company is to potential employees. What makes Talent Brand Index so unique is that unlike traditional methods that rely exclusively on surveys, it measures your talent brand based on the actual behavior of 175 million professionals. Each year, over 15 Billion interactions take place between professionals and companies on LinkedIn. We cross-referenced this data with thousands of surveys to pinpoint the specific types of actions that tell us when professionals are interested in a company as a place to work—things like connecting to employees, viewing their profiles, visiting company pages, and following companies. Talent Brand Index takes two factors into account: Talent Brand Reach, which measures how many professionals are familiar with your company as a place to work, and Talent Brand Engagement, which measures how many people express an interest. Talent Brand Index is simply engagement divided by reach. This single metric tells you how effectively you’re turning professionals who are aware of your company as an employer into prospects showing stronger signs of interest. In other words, how attractive you are to your key talent pool. We used a similar analytical framework to compare the over two million companies on LinkedIn and identify the hottest talent brands. 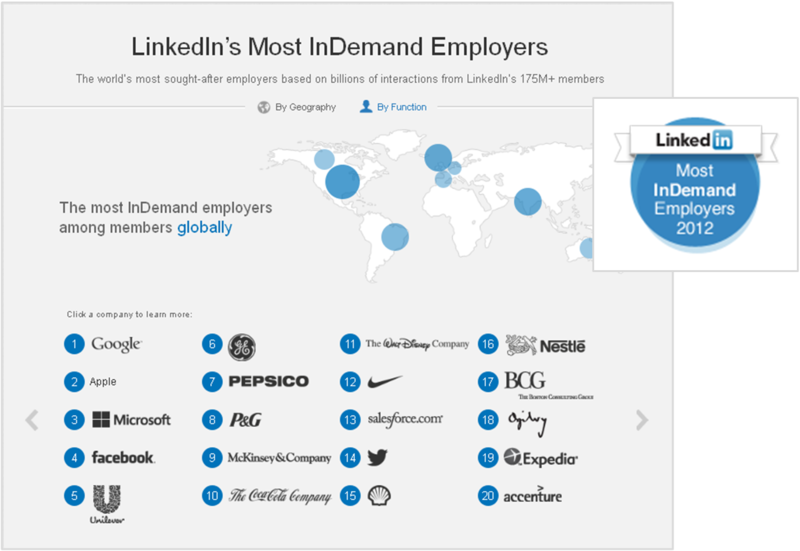 Today we’re unveiling LinkedIn’s Most InDemand Employers, a set of rankings of the world’s most sought-after companies, also informed by billions of actions on LinkedIn. In addition to the global list, we’ve compiled the most InDemand employers in five countries and four functional areas. At LinkedIn we’re passionate about using our treasure trove of data, and we get really excited when we can share insights that help our clients recruit more strategically. That’s why we’re offering Talent Brand Index free of charge to our corporate customers. Please contact your LinkedIn representative or click here to learn more. For best practices in building your brand, visit our brand new employer branding best practices page. Here’s to measuring your talent brand and to managing it better and better.